This year?s Jamaica Investment Forum (JIF), like previous years, didn?t disappoint. Held in Montego Bay, Jamaica and sponsored by JAMPRO, the three-day event was well attended by media and investors from all over the world and featured an impressive line-up of speakers including international and local investors as well as Jamaican government ministers who, in this third staging of JIF, made the case that investing in Jamaica is not only a good decision, but a profitable one. ?We want to reveal to investors the untapped possibilities in Jamaica and demonstrate that we have significant business opportunities with an equally advantageous ecosystem, which includes a vibrant economy with brilliant talent and many new developments taking place,? Diane Edwards, president of JAMPRO, said. One sector that has seen steady growth is the agriculture, forestry and fishing industry. According to the Gleaner, the third quarter of 2016 saw a 28 percent increase in output and the agriculture, forestry and fishing industry was largely responsible for most of the 2.2 per cent estimated gross domestic product (GDP) expansion of the Jamaican economy. 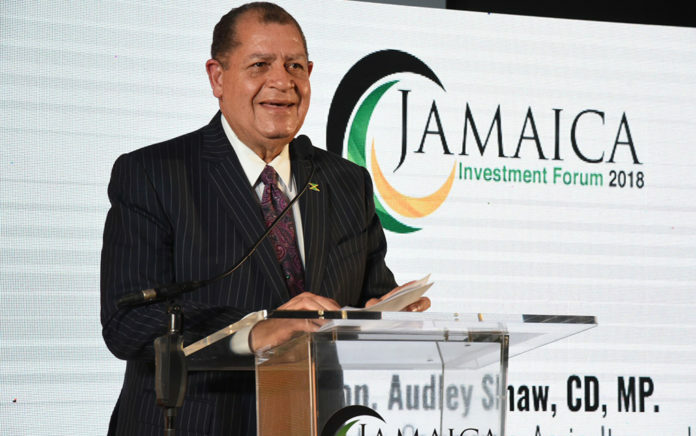 Audley Shaw, Minister of Industry, Commerce, Agriculture and Fisheries, took the time to speak with TNJ.com about Jamaica?s agriculture business. Here, in his own words, Shaw shares some of the advancements and issues with regard to agriculture as a driver of growth in Jamaica. ?For far too long, we have been dependent on sugar cane. For a variety of reasons, global demand and the curtailment of market advancements into Europe, we are obliged to downscale into other crops. Right now, we have 18,000 acres of land set aside for sugar, but only 3,000 acres are in production. The remaining acres sit on idol lots. We want to get into aggressive diversification such as cassava, as a substitute for barley and fermentation of beer, sweet corn, onions and hot peppers. In addition, sea- island cotton is becoming a hot item. Not to exclude cannabis, but these are the replacement crops for the future of replacing sugar cane.??????? ?We will divest the land to farmers and encourage ?mother farms? where people can sublet to smaller farmers seeds, fertilizer. We will be able to supervise and provide technology to improve the overall operations. In this way, we will expand the ?mother farm? aspect.?
? ?For too long, people target tourism here and export far too many things from Jamaica. We will look to target markets for fresh things and we will look to large companies to provide leadership and to make sure we are doing things to export markets. This model is necessary as a foundation of the agriculture business in Jamaica.? But for every success story, there are challenges. Deep-sea fishing is among the areas that Jamaica hopes to improve in, when the right technology is in place, as well as cannabis which, says Shaw, currently has an established framework for medicinal purposes and is on track to becoming a $150 billion industry in the next 3 to 4 years. According to Shaw, maximizing linkages remains a challenge. ?We don?t want to fly in everything, so making value-added linkages work for our economy is one of our key objectives. ?